While many people focus on the features of the hot tubs they’re about to buy, knowing what the manufacturer’s warranty covers is key. The best warranty will always be the one that guarantees you won’t have to pay for repairs if your hot tub needs them. Below, you’ll learn more about warranties and how to find a good one. The first thing to look for is a warranty that you can see directly on the manufacturer’s website. A good warranty will always be posted online. Take the time to read it so you can bring any questions you have to your hot tub retailer. As you review the warranty, make sure it covers the full range of hot tub parts such as the shell, plumbing, and equipment. In addition, it should cover labor costs and mention any limitations or exclusions. If you plan to install your hot tub on a rental property, pay special attention to whether the manufacturer’s warranty will cover it. So, who has the best warranty? This depends on your needs, but a key indicator is the company’s reputation. High-quality brands tend to have good reputations, demonstrating that they take exceptional care of their customers. If you’re not familiar with a brand, research it online. One thing to remember about new companies is that if they don’t survive, they will not be around to provide parts or repair services. On the other hand, if a company has been around for quite a while, they will be more likely to help you when you need it. Some issues that are common to warranties include prorated warranties where you have to pay for a percentage of the repairs. Also find out from your dealer whether they have parts in stock and can provide you with repairs. Ideally, it’s best to work with someone near you with parts onsite so they can quickly complete repairs. Also make sure the warranty includes the cost of transportation to and from your home. 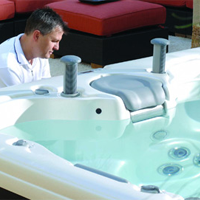 Now that you know the ins and outs of the best hot tub warranties, download our buyer’s guide to learn about hot tubs with warranties that are right for you.